Fertilize: when a sperm and an egg join. Mathematician: a person who studies the relationships between numbers. Tissue: a similar group of cells within an animal or plant that work together to do a certain job. There is an old story told to this day about a land filled with colorful monsters. In this mysterious world lived a family of monsters with a brother and sister, Matt and Matilda. Matt and Matilda shared everything – their monster toys, their monster candy, and even their monster dolls and trucks. One day, Matt and Matilda told their mother that they wanted to share their spots too – they were both blue, but Matt had green spots and Matilda had purple spots. “Oh, my lovely monsters,” started Momma, “you are both so sweet, but you cannot share your spots, for your bodies are made to look different from any other monster’s body. “You mean no one else has the same instructions as we do?” Matilda asked. “Well, since you two aren’t identical twins, each of you is the only monster with your particular instructions. Let me explain…” and Momma Monster then told her young monsters all about their tiny cells and the special instructions inside them called DNA. 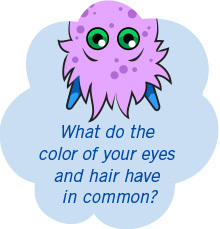 Inside living things are cells, some living things are only one cell and others, like plants, animals and monsters have many types of cells. Adult humans have trillions of cells. The DNA in cells has all the instructions to build and make that living thing work. “All of the tissues in our body like our skin, bones, and muscles are made of tiny compartments called cells. Most cells are so small we cannot see them without using a tool to make tiny things look much bigger. Your cousin Mike has one – it’s called a microscope. “Each of these cells has instructions on how to build bodies, whether it’s a monster cell with instructions for a monster body, or a chicken cell with instructions for a chicken body. Chickens are a good example of how one special cell, the egg, can be large enough to see with your eyes. “Every living thing has DNA, including all monsters, plants, and animals -- even those strange creatures called humans that live across the seas. Matt and Matilda were both still confused. “But how can so many different things be decided from one tiny set of instructions?” asked Matilda. 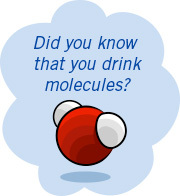 The water you drink is made of molecules that have two hydrogen atoms and one oxygen atom. “Well,” started Momma, “think of the monster alphabet which, like the human alphabet, has 26 different letters. From these 26 letters, we can make thousands and thousands of monster words. When put together, these words can make beautiful monster stories. “Now imagine you had only four letters. You could still string together long lines of different combinations – as many as you wanted. DNA is just like a long string of unique combinations of four letters. Each of those four letters stands for a specific molecule, or collection of atoms. Atoms are the tiny building blocks from which everything is made. “We do like colors!” Matt and Matilda agreed. “Okay then,” continued Momma, “colors it is. 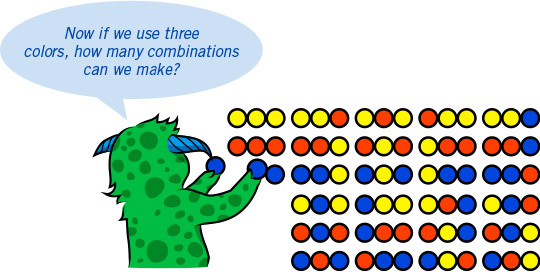 We will think of combinations that are three dots long. Let’s start with just one color: yellow. 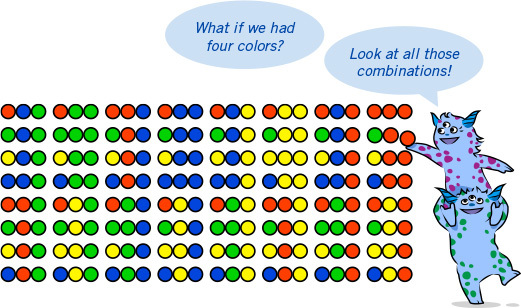 If we had only yellow dots, how many combinations could we make? “Only one, right? The whole thing would have to be yellow, since that’s the only color we have. “What’s really amazing is how unique these instructions can be using only four different colors. 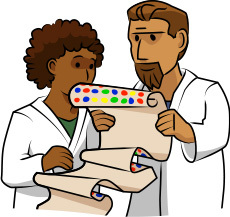 “Let’s think again about our four colors that stand for different DNA molecules… red, yellow, blue, and green. These colors could join together like colored beads in a long necklace or strand, hundreds or thousands of beads long. “Now imagine one more thing – a DNA necklace actually has two strands of colors or molecules that almost always like to stick together. For example, red beads stick to yellow, and blue stick to green. “In these double strands there are sections that we call genes. A gene is a section of DNA that decides what traits we will have, such as if our two horns will be purple or blue, or what color spots we might have. Scientists study DNA to learn about human variation and health. Wide-eyed Matt and Matilda listened as Momma monster continued. “Scientists use powerful computers that can quickly search through the very long strands of instructions, called a genetic code. They look for patterns in the code. Most of the time, scientists find instructions that make the human body work the same in different people. “But, sometimes a single color will be different than it should be, or there is an extra color or one missing. 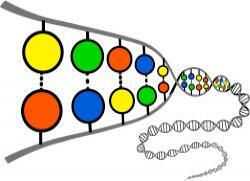 These are called DNA mutations, which means the DNA is changed. 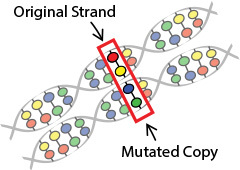 Drawing showing a mutation between the two strands. “By finding these mistakes in the pattern, scientists may learn what part of the code might be causing problems, such as different diseases, or which instructions may help a person avoid getting sick. “Of course you can, my little monster, no matter what your DNA says. Your DNA may decide what you are made of and what you look like, but you get to decide what you do with your wonderful monster life. Matt thought and thought and then thought some more about these body-building instructions called DNA. 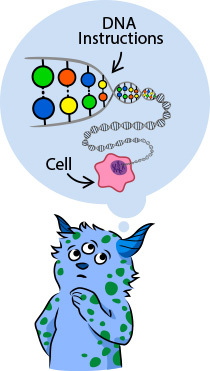 Could they really be in every single cell in a monster’s body? After a long time he approached Momma monster. “Momma, how does the same set of instructions get into every one of my cells and where do those instructions come from?” he asked. “Well, my marvelously curious monster, let’s start with where the instructions come from. 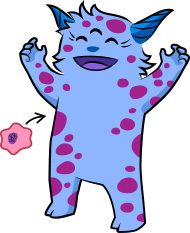 The two parents of a monster child each make special types of cells. “Momma monsters, like me, make what are called eggs, and Daddy monsters make what we call sperm. “These two special types of cells, eggs and sperm, each have some monster building instructions in them. Eggs have some of Momma’s instructions, and sperm have some of Daddy’s instructions. “When these cells join, the egg is fertilized, or activated. You can think of it as the egg waking up so it can start to grow. 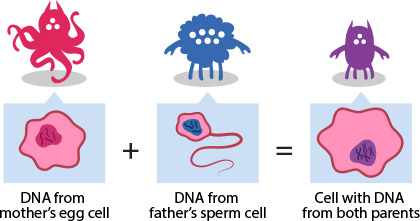 The instructions in both the egg and the sperm join together to make monster DNA, like yours. “This is why sometimes baby monsters have parts of them that look a little like their mom and sometimes they have parts that look a bit like their dad. “You can see that with each of you. Matilda, you have purple spots like your dad, and Matt, you have green spots like mine. “Now, on to how the instructions end up in every one of your cells... As your first cells grew and split into more and more cells to form your body, the instructions were passed along to each new cell. 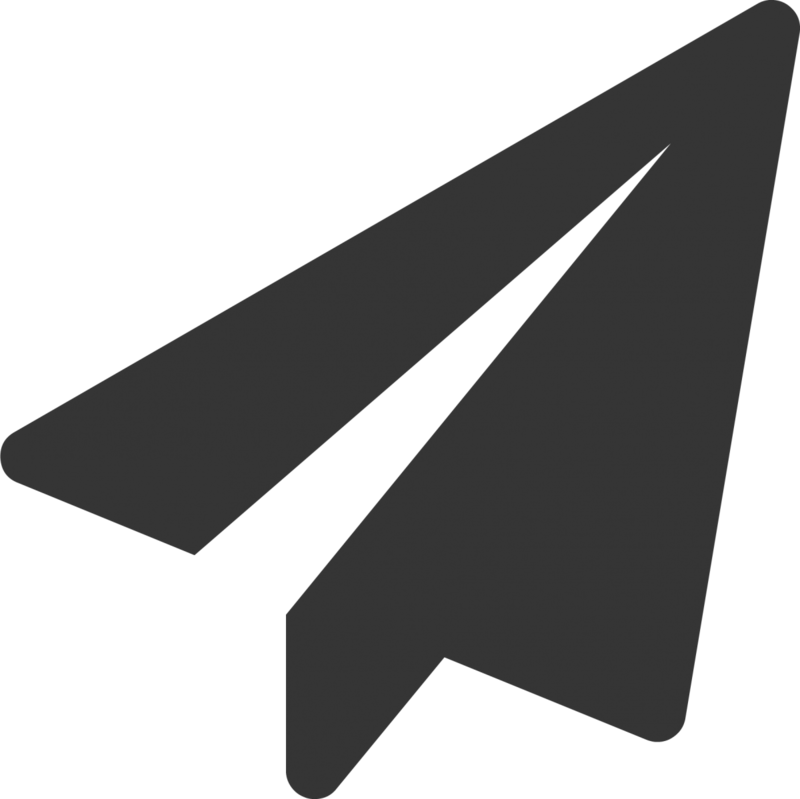 “The instructions would be copied within a cell, and then as that one cell breaks into two different cells, each cell only takes one copy of the instructions. “There is a complete set of instructions in each cell, but they only use the part they need to do their job. This lets our body grow different types of tissue, such as skin, bone, and muscle. The DNA instructions in cells are used to build a whole body. “It sure is!” agreed Matt and Matilda. Even though the two little monsters had learned that they could not share everything with one another, they happily went back to playing together, while showing off their uniquely colored spots. 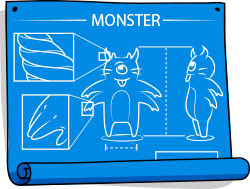 Click the monster button above to build a monster. “Now that I’ve told you two all about DNA,” said Momma Monster, “we can play a monster DNA game. We will pretend that the three colored dots match to letters that make words. To build monsters you need a special code. Learn about the amazing instruction set inside all living things.